bl.uk > Online Gallery Home	> Online exhibitions	> Asia, Pacific and Africa Collections	> Banian tree at Hardwar. 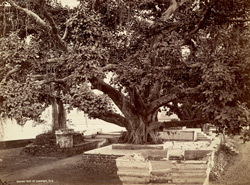 Photograph of a Banyan tree at Haridwar, from the Elgin Collection: 'Spring Tours 1894-98'. This is a later print (1890s) of a Bourne photograph. Haridwar is a town of great religious significance. It is situated in the foothills of the Himalayas and is the first major town on the River Ganges at the point where the river flows onto the plains. Blessed by the trinity of Lord Shiva, Vishnu and Brahma, Haridwar has always been a major pilgrimage site for Hindus. The Ganges here is quite calm and clear and the many bathing ghats are always full with people performing ablutions. Banyan trees are usually found at such spots as they are considered sacred. The banyan tree branches extend roots and regenerate themselves like new trees over a large area. This characteristic and the longevity of the tree makes it a focus of sacred beliefs and it is an integral part of the myths and legends of India. Venerable banyan trees, sometimes hundreds of years old, are known to spread over an astonishing acreage.